Well, I watched The Dark Knight Rises again last night, and it was still as bloody amazing as I remember it to be. Plus, it looks stunning on Blu-Ray. It was cool to watch it alone at home because I could let my ugly crying all out. Seriously, I was pretty much screaming and then I was doing this thing where I was crying but smiling at the same time - I looked like the Joker. 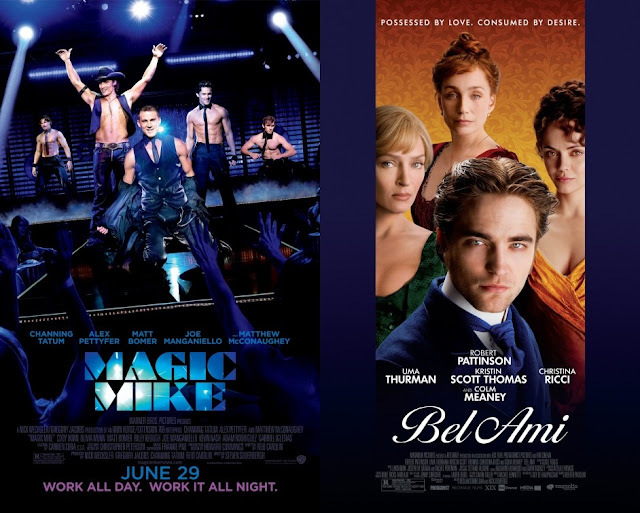 So anyway, with that all cleared up for now (until I buy it on Blu-Ray and watch it over and over again for the rest of the week), the only releases for this week I have left to watch are Magic Mike and Bel Ami. And I should probably watch The Wicker Man, but I might leave that Cage Rage for tomorrow. Just because I'm beyond excited for Les Miserables. So excited that I can't even live life without seeing it. 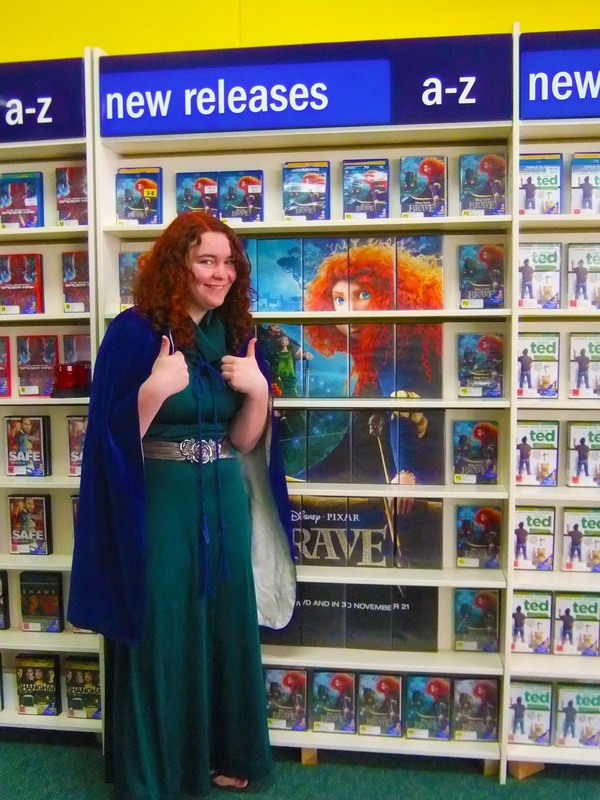 You may have seen this already but for the Christmas parade last weekend I dressed up as Princess Merida, kind of to promote Brave, and because I don't have the figure for a Catwoman outfit. And here was the result. My hair isn't naturally that colour, but I do have ringlets like Merida's...they just aren't as wild. If you're interested, there was an article about me in the paper (not the local one - a city one, which is kind of a big deal in good old NZ). My Killer Joe review was quoted and everything. Plus, I've obviously got more than 50,000 hits (nine times that, in fact), but hey, this was some good exposure! Awards Daily has some early praise for Zero Dark Thirty, which points towards the possibility of Jessica Chastain winning Best Actress. That would make me the happiest person on Earth. Speaking of Jess, Sati has a review of Lawless. I've given up caring about this movie - which comes out in cinemas here in February, for heaven's sake - and her review reminds me of why I feel that way. Bonjour Tristesse sheds some light on Laurence Anyways, a movie which I have a little bit of interest in. Especially because this is Xavier Dolan's third film, and he is only 23. I've officially named The Perks of Being a Wallflower my "favourite movie that I haven't seen" - and Andy's review tells me that there's no way that I'm not going to adore it. Jessica writes a wonderful post on why it is okay to go to the theatre alone. On the odd occasion that I do get the opportunity to go to the cinemas, I usually prefer going alone. That means I get to cry alone. Alex made a list of his favourite movie character introductions, and Nikhat followed suit. I feel a blogathon coming on! Mettel loved Brave, which I think will end up being one of the most underrated mainstream films of the year. It is so darn brilliant. Do you have a 'favourite movie you haven't seen yet'? I love that photo - you are too awesome. Thank you for the link love! What an awesome article in the newspapers about you! - Do you have a 'favourite movie you haven't seen yet'? Neither! I have less than two months until I get to see it...it is so far away! I always preferred the cinema experience by myself, not least because if I didn't like the film I could walk out of it. Hard to do that when you're with someone else. Ha, I'd never dream of walking out. But that's because going to the cinema is such a big deal for me, with it being so far away and all. Your question applies to this year, yes? I will saw Perks of Being a Wallflower, since I just finished the book and really liked it, and Django Unchained 'cuz duh. And yah. I can't wait for Django! Fave flick I haven't seen yet... gotta be Django and Zero Dark Thirty. You're welcome! And I concur. Favorite movie I haven't seen yet...I'm leaning towards either The Hobbit or Django Unchained. Didn't know you were looking forward to The Hobbit! I'm all Hobbit-ed out for the moment, and it hasn't actually officially been released in cinemas yet. Favorite movie I haven't seen yet...Holy Motors. I should have seen Holy Motors at the film festival. Silly, silly me. That was an awesome article about you! Congrats! Thanks for the link! My favorite movie I haven't seen yet...I'm not sure if I'm even anticipating anything with much excitation but probably Silver Linings Playbook. You're welcome. Silver Linings Playbook is another one of my hotly anticipated movies! Thanks Stevee! Nice hair dye job! Cool photo, you look lovely! The Les Miserables trailer looks really good, I am now intrigued!